Zinc finger E-box-binding homeobox 1 is a protein that in humans is encoded by the ZEB1 gene. ZEB1 (previously known as TCF8) encodes a zinc finger and homeodomain transcription factor that represses T-lymphocyte-specific IL2 gene expression by binding to a negative regulatory domain 100 nucleotides 5-prime of the IL2 transcription start site. ZEB1 and its mammalian paralog ZEB2 belongs to the Zeb family within the ZF (zinc finger) class of homeodomain transcription factors. 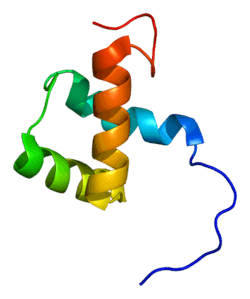 ZEB1 protein has 7 zinc fingers and 1 homeodomain. The structure of the homeodomain shown on the right. Mutations of the gene are linked to posterior polymorphous corneal dystrophy 3. A recent study suggested its contributing role in lung cancer invasiveness and metastasis development. ↑ Williams TM, Montoya G, Wu Y, Eddy RL, Byers MG, Shows TB (Dec 1992). "The TCF8 gene encoding a zinc finger protein (Nil-2-a) resides on human chromosome 10p11.2". Genomics. 14 (1): 194–6. doi:10.1016/S0888-7543(05)80307-6. PMID 1427828. ↑ Williams TM, Moolten D, Burlein J, Romano J, Bhaerman R, Godillot A, Mellon M, Rauscher FJ, Kant JA (Feb 1992). "Identification of a zinc finger protein that inhibits IL-2 gene expression". Science. 254 (5039): 1791–4. doi:10.1126/science.1840704. PMID 1840704. 1 2 "Entrez Gene: ZEB1 zinc finger E-box binding homeobox 1". ↑ Williams TM, Moolten D, Burlein J, Romano J, Bhaerman R, Godillot A, Mellon M, Rauscher FJ, Kant JA (December 1991). "Identification of a zinc finger protein that inhibits IL-2 gene expression". Science. 254 (5039): 1791–4. doi:10.1126/science.1840704. PMID 1840704. ↑ Bürglin TR, Affolter M (2015). "Homeodomain proteins: an update". Chromosoma. x (x): x. doi:10.1007/s00412-015-0543-8. PMID 26464018. ↑ Liu W, Huang YJ, Liu C, Yang YY, Liu H, Cui JG, Cheng Y, Gao F, Cai JM, Li BL (2014). "Inhibition of TBK1 attenuates radiation-induced epithelial-mesenchymal transition of A549 human lung cancer cells via activation of GSK-3β and repression of ZEB1". Lab. Invest. 94 (4): 362–70. doi:10.1038/labinvest.2013.153. PMID 24468793. Franklin AJ, Jetton TL, Shelton KD, Magnuson MA (1994). "BZP, a novel serum-responsive zinc finger protein that inhibits gene transcription.". Mol. Cell. Biol. 14 (10): 6773–88. PMC 359208 . PMID 7935395. Watanabe Y, Kawakami K, Hirayama Y, Nagano K (1994). "Transcription factors positively and negatively regulating the Na,K-ATPase alpha 1 subunit gene.". J. Biochem. 114 (6): 849–55. PMID 8138542. Ikeda K, Halle JP, Stelzer G, Meisterernst M, Kawakami K (1998). "Involvement of negative co-factor NC2 in active repression by zinc finger-homeodomain transcription factor AREB6.". Mol. Cell. Biol. 18 (1): 10–8. doi:10.1128/mcb.18.1.10. PMC 121442 . PMID 9418848. Turner J, Crossley M (1998). "Cloning and characterization of mCtBP2, a co-repressor that associates with basic Krüppel-like factor and other mammalian transcriptional regulators.". EMBO J. 17 (17): 5129–40. doi:10.1093/emboj/17.17.5129. PMC 1170841 . PMID 9724649. Postigo AA, Dean DC (1999). "ZEB represses transcription through interaction with the corepressor CtBP.". Proc. Natl. Acad. Sci. U.S.A. 96 (12): 6683–8. doi:10.1073/pnas.96.12.6683. PMC 21975 . PMID 10359772. Hlubek F, Löhberg C, Meiler J, Jung A, Kirchner T, Brabletz T (2001). "Tip60 is a cell-type-specific transcriptional regulator.". J. Biochem. 129 (4): 635–41. doi:10.1093/oxfordjournals.jbchem.a002901. PMID 11275565. Locklin RM, Riggs BL, Hicok KC, Horton HF, Byrne MC, Khosla S (2002). "Assessment of gene regulation by bone morphogenetic protein 2 in human marrow stromal cells using gene array technology.". J. Bone Miner. Res. 16 (12): 2192–204. doi:10.1359/jbmr.2001.16.12.2192. PMID 11760832. Guaita S, Puig I, Franci C, Garrido M, Dominguez D, Batlle E, Sancho E, Dedhar S, De Herreros AG, Baulida J (2002). "Snail induction of epithelial to mesenchymal transition in tumor cells is accompanied by MUC1 repression and ZEB1 expression.". J. Biol. Chem. 277 (42): 39209–16. doi:10.1074/jbc.M206400200. PMID 12161443. Costantino ME, Stearman RP, Smith GE, Darling DS (2002). "Cell-specific phosphorylation of Zfhep transcription factor.". Biochem. Biophys. Res. Commun. 296 (2): 368–73. doi:10.1016/S0006-291X(02)00880-X. PMID 12163027. Postigo AA (2003). "Opposing functions of ZEB proteins in the regulation of the TGFbeta/BMP signaling pathway.". EMBO J. 22 (10): 2443–52. doi:10.1093/emboj/cdg225. PMC 155983 . PMID 12743038. Postigo AA, Depp JL, Taylor JJ, Kroll KL (2003). "Regulation of Smad signaling through a differential recruitment of coactivators and corepressors by ZEB proteins.". EMBO J. 22 (10): 2453–62. doi:10.1093/emboj/cdg226. PMC 155984 . PMID 12743039. Dillner NB, Sanders MM (2004). "Transcriptional activation by the zinc-finger homeodomain protein delta EF1 in estrogen signaling cascades.". DNA Cell Biol. 23 (1): 25–34. doi:10.1089/104454904322745907. PMID 14965470. Beausoleil SA, Jedrychowski M, Schwartz D, Elias JE, Villén J, Li J, Cohn MA, Cantley LC, Gygi SP (2004). "Large-scale characterization of HeLa cell nuclear phosphoproteins.". Proc. Natl. Acad. Sci. U.S.A. 101 (33): 12130–5. doi:10.1073/pnas.0404720101. PMC 514446 . PMID 15302935. Shimizu S, Krafchak C, Fuse N, Epstein MP, Schteingart MT, Sugar A, Eibschitz-Tsimhoni M, Downs CA, Rozsa F, Trager EH, Reed DM, Boehnke M, Moroi SE, Richards JE (2005). "A locus for posterior polymorphous corneal dystrophy (PPCD3) maps to chromosome 10.". Am. J. Med. Genet. A. 130 (4): 372–7. doi:10.1002/ajmg.a.30267. PMC 1249494 . PMID 15384081. Eger A, Aigner K, Sonderegger S, Dampier B, Oehler S, Schreiber M, Berx G, Cano A, Beug H, Foisner R (2005). "DeltaEF1 is a transcriptional repressor of E-cadherin and regulates epithelial plasticity in breast cancer cells.". Oncogene. 24 (14): 2375–85. doi:10.1038/sj.onc.1208429. PMID 15674322.